Minimum 3 Adults or $300.00 Flat Rate. Guests will be combined in groups to reduce rates where possible. 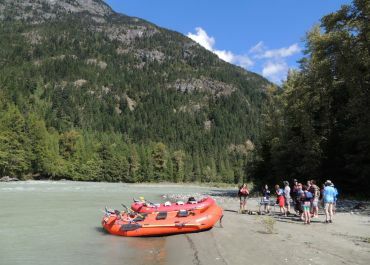 Eco-Rafting is a combination of ecological interpretation and a scenic wilderness river drift through the unique coastal habitat of BC's Bella Coola Valley, accompanied by a biologist and river guide!!! Trips and tours are available on the Bella Coola or Atnarko Rivers and range from 3 to 5 hours, making it a perfect afternoon or morning excursion. Longer eco-adventures are available and all trips include snacks and transportation. Eco-rafting trips focus on various natural habitat and topics, depending on the season and ecosystem activity at that time. You can expect to see a variety of British Columbia wildlife and fish, as well as being able to ask your biologist/guides questions about the coastal region and the temperate rain forests of Western Canada. Although this is not a bear watching tour, it is not uncommon to see grizzly or black bears along the river edge; however, best bear watching opportunities are on our Bear Viewing Tours offered in late summer and autumn when grizzly and black bears are at the river edge feeding on salmon. In spring and summer numerous birds, including eagles, waterfowl, kingfishers, merlin, heron and songbirds congregate in the biologically diverse riparian areas adjacent to Bella Coola Valley's rivers and streams, flourishing in British Columbia's lush coastal temperate rain forest. Small mammals including otter, mink, fox, beaver and deer are also commonly seen on eco-rafting tours. Black bears are active throughout most of the summer and fall throughout the Bella Coola Valley and chances of seeing a black bear is possible on any trip!!! Guides will explain bear habitat, bear life cycles, feeding and mating cycles and show you grizzly and black bear tracks where they are present. Differences between black bear and grizzly bear species will be explained as well as importance of salmon for a bear. Eco-Rafting is a popular family-friendly tour and an excellent way for groups to discover the hidden areas of the Central Coast of Western Canada and Great Bear Rain Forest in complete comfort. Groups of 4 to 12 guests can be accommodated, with individuals or families also welcome on any tours! Tour Information & Frequently Asked Questions follow this link to a PDF file of information to help you prepare for your tour! Follow this link to our Contact and Booking Form to request a tour reservation Book Here!